Who doesn’t love a bundle of wooden toys! There is just something special about them isn’t there and it is so nice to see them still being enjoyed by little people today. 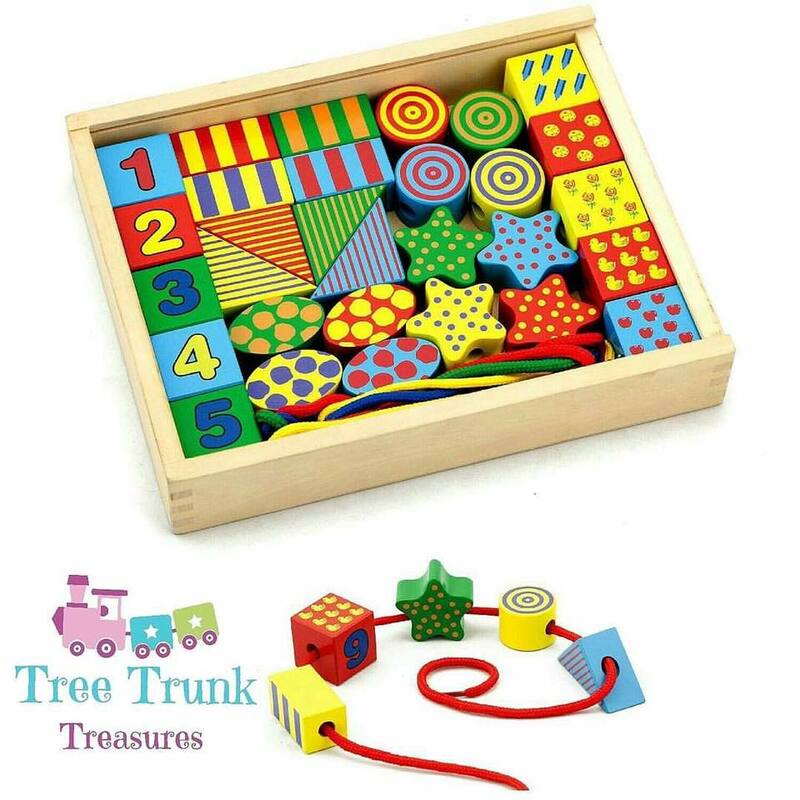 Tree Trunk Treasures is a lovely small online toy company specialising in quality wooden toys for both boys and girls of all ages. All of their toys are made with non toxic paints perfect for your little ones! We were approached to review a few of their products, so let’s see what Popitha thought. We were kindly gifted three products to test. A ‘Molly Dolly Wooden Bakery’, a ‘Calender Clock’, and ‘Wooden Lacing Blocks’. All different toys and all played with in very different ways. As you can see, this wooden bakery stall is very cute and will look fabulous in any child’s playroom. It comes with 4 sets of wooden cakes and breads in trays which includes 1 set of 6 wooden cakes, 1 set of 6 wooden biscuits, 2 sets of 4 breads. The cakes come in their own little paper cups. This product was perfect for the girls and they played with it in a variety of ways. Upon opening the box, the instantly pretended to eat the cakes. They are beautifully painted and look inviting which encouraged the role play straight away. Over several days, I modelled different settings and introduced vocabulary to the girls to build up their word bank. With started with a simple word like ‘These taste nice’, and then moved to delicious, scrumptious, tasty. We then introduced some counting and counted the cakes in and out of their cases. Tabitha showing me 1 cake! We enjoyed going to the bakery to buy some bread. We took real money and had to pay in pennies. This encouraged counting, coin recognition, speaking and listening. We invited all of our teddies to join us for a teddy bears picnic. The twins loved making the sandwiches using the pretend bread and feeding the bears the pretend cake. Whilst making the sandwiches, we went through the instructions on how to make a sandwich which included time connectives; First, next, then, after. 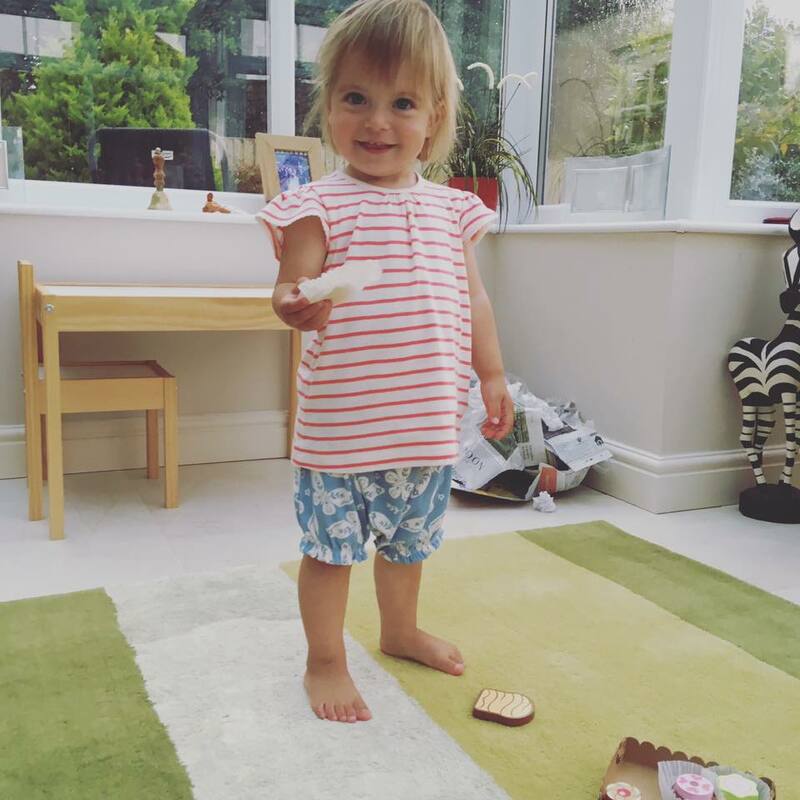 The Molly Dolly Wooden Bakery is perfect for imaginative games which helps to develop social skills. Young children will enjoy arranging the tasty cakes and sandwiches on the stand. 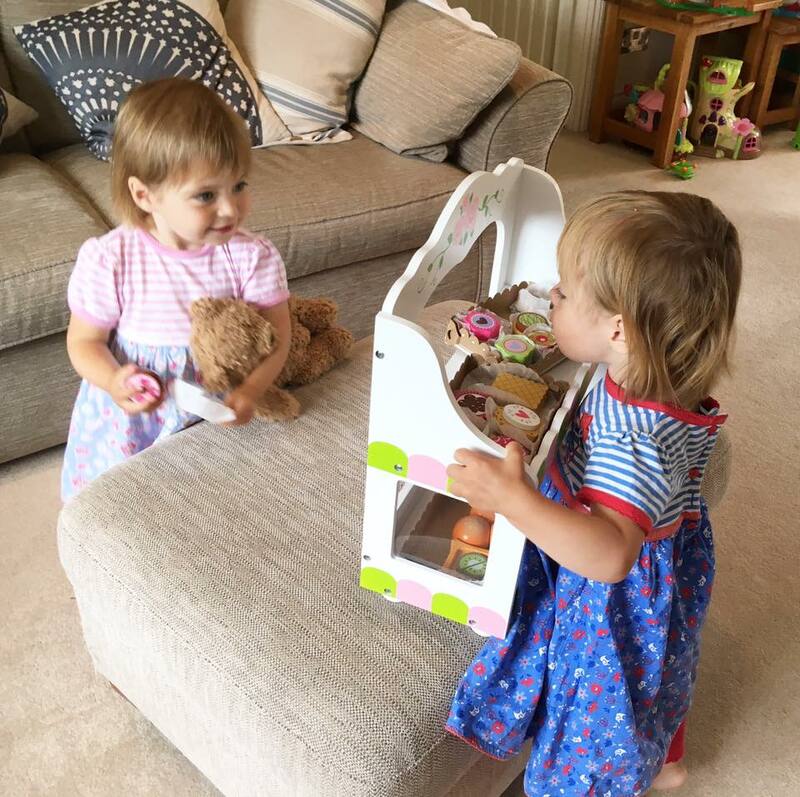 They can sit down to chat and share with their special teddy and dolls or have a special tea party with their friends. Made from colourful wood, this set will provide endless hours of fun. 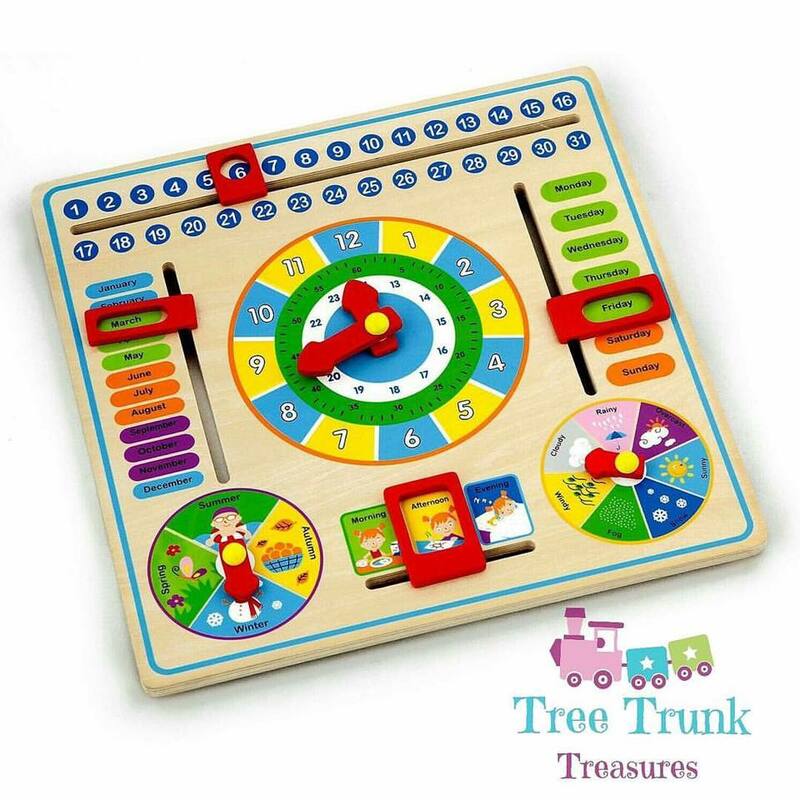 I chose the wooden calendar clock as it is great for kinaesthetic and visual learners. 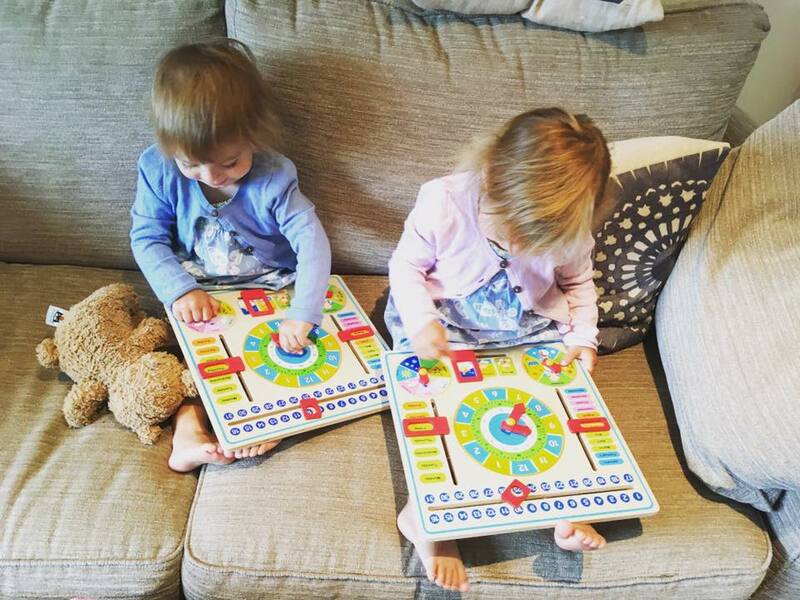 It has helped me and will help me to introduce the twins to a number of different concepts; How to tell the time, number recognition, days of the week, months of the year, the weather and seasons. The more we can expose our little ones too from an early age, the more they absorb. They are like little sponges and take so much in; more than we realise. The girls enjoyed plaining with the moveable hour and minute hands on the clock, and although they are not ready to tell the time yet, they like placing the hands in different positions with me telling them the time they have made. 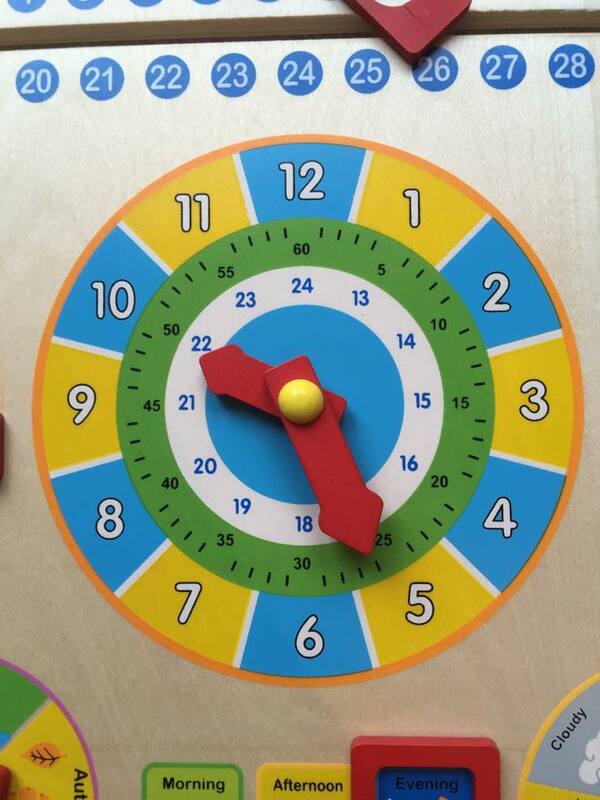 However, this wooden teaching clock is perfect for children who are just beginning to learn to tell the time. Every day we talk about what the date is and change it and also spend some time looking at the weather, discussing what it is doing that day. We also point to the numbers and count to 31. This jumbo box of brightly coloured wooden beads are educational as well as fun! Children can create endless different designs by threading the wooden beads along the lace and combining the different shapes and colours. This teaches repeating patterns, concentration, colours, shapes and allows little hands to use their fine motor skills when threading. All of the beads have large enough to hold securely with good size holes to make it easy for toddlers to thread the laces through. They are stored in the wooden box with sliding lid. It includes 30 assorted colours and shapes all hand painted on both sides and 4 laces. I simply love wooden toys. I love the way they look, I love the quality they bring and I love it that they last. Tree Trunk Treasures toys do not fail to impress.